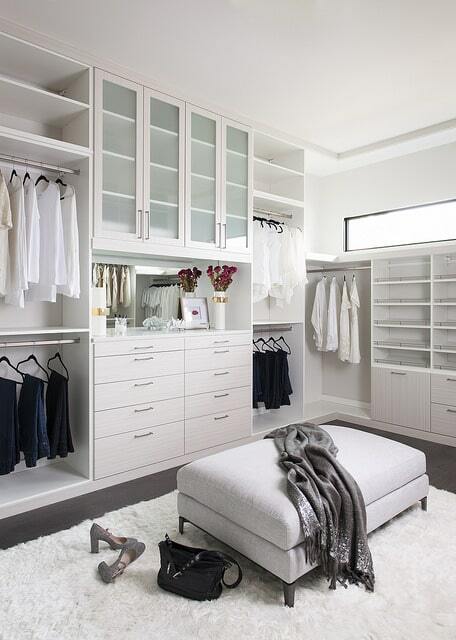 Are you dreaming of customizing your closet? If so, you might already have some idea of what you would like to change, but you may not be quite sure about the final design. 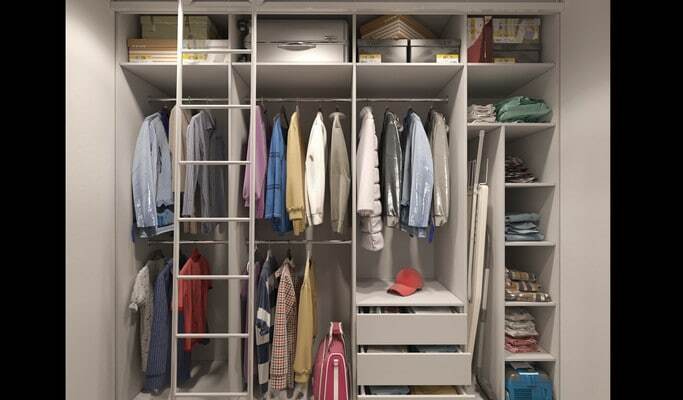 More Space Place can help you come up with the perfect closet system to meet your wants and needs. 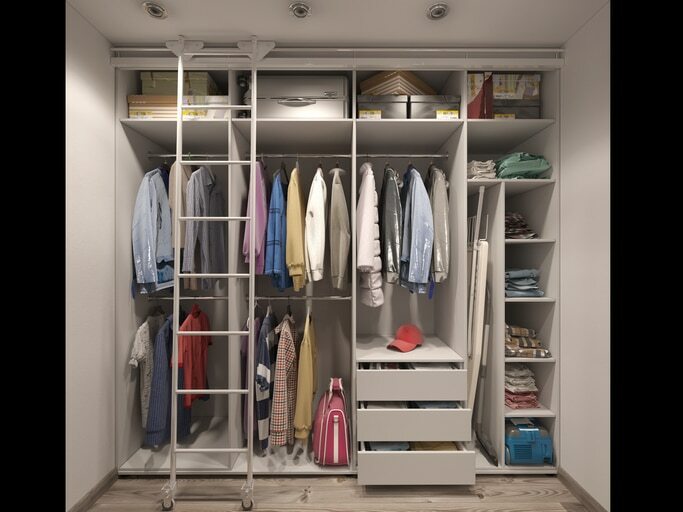 The following are 10 popular and exciting ideas homeowners in the Sarasota, Lakewood Ranch, and Port Charlotte areas choose when customizing their closets. If space allows, an island in the middle of your closet with dresser drawers doubles as both a stylish and functional addition. It allows for counter space to use for setting out outfit ideas while also providing storage space for folded clothing items. Ideally, you should have at least 3 feet of space around the island. Another option for a medium-sized closet is a peninsula dresser, which is attached to one wall and runs out perpendicularly. 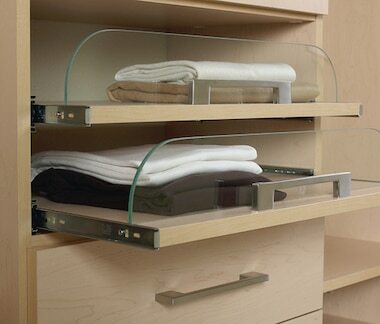 Floor-to-ceiling cubby systems where you can store and display your shoes are a popular solution. Standard cubby spaces are suitable for most any size shoe, from high heels to sneakers to ankle boots. However, you can also design custom sizes to accommodate larger shoes, such as tall boots. Get rid of the stray laundry basket on the floor and instead install a clothing hamper that slides out when you need it and then can be hidden away when you don’t. A rack that allows you to hang numerous pairs of pants close together is both space saving and convenient for organization. There are also models that slide in and out of their location so they can be tucked away and out of sight when not in use. 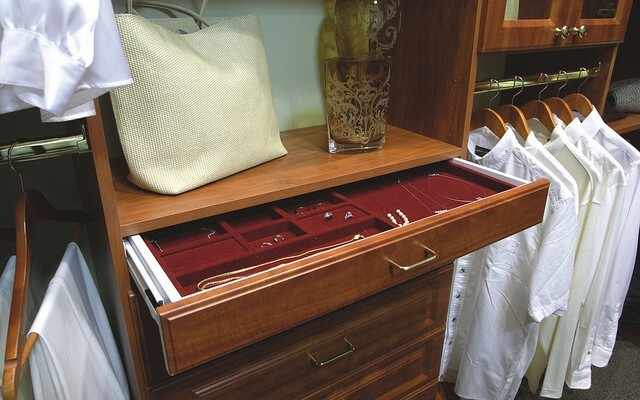 Ditch the disorganized jewelry box in favor of a customized rack and drawer system that will keep your jewelry safe and secure. Be sure to take inventory of your jewelry to make sure you include a variety of different sized compartments and hanging areas built specifically for your collection. Larger hanging hooks are ideal for storing and displaying your handbag and purse collection while keeping them accessible. If you don’t have many purses to store, hooks are also great for other accessories, such as scarves and belts. This trend in custom closets has been surging lately. 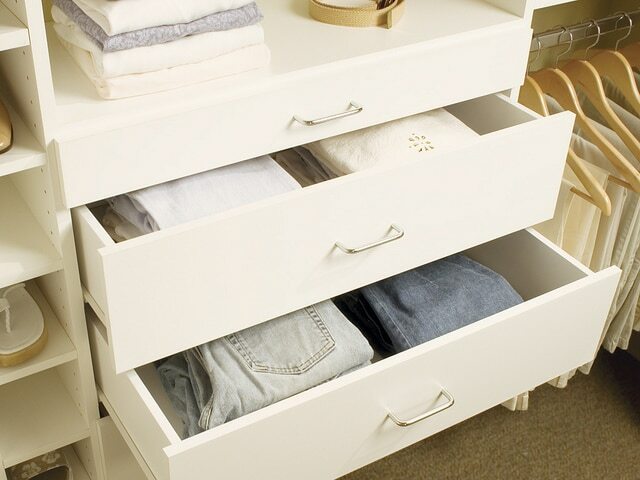 It gives a sleek, finished look to your closet storage while also allowing you to view your wardrobe. Having your clothes visible can aid in your outfit decision-making process each morning. 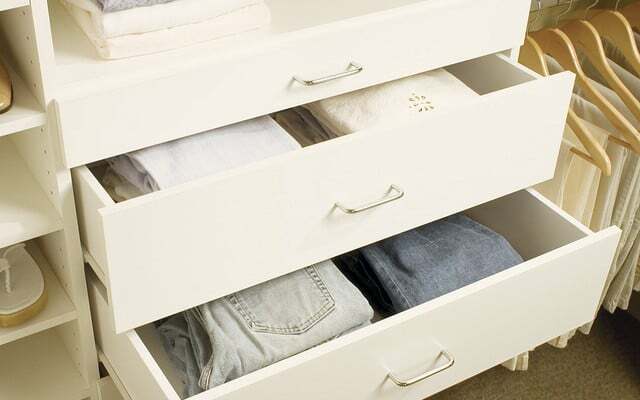 Avoid the jumbled drawer syndrome by adding drawer dividers. They’re great for organizing, as they allow you to keep things separate. Dividers work especially well for smaller items. 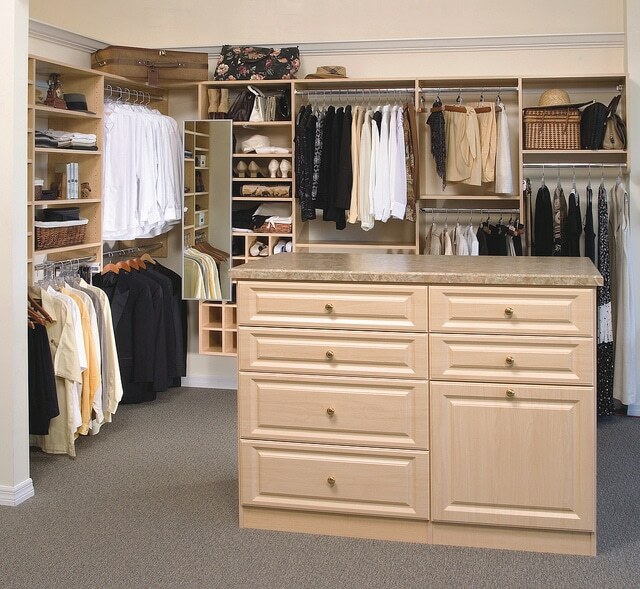 Customization allows you to transform an ordinary walk-in closet into a boutique dressing room. With a mirror, compact dresser, drawers, and a small seat or ottoman, you’ll never have to fight over the bathroom mirror again. More than just a tie rack, this add-on allows guys to store their cuff links, extra wallets, sunglasses, handkerchiefs and more. 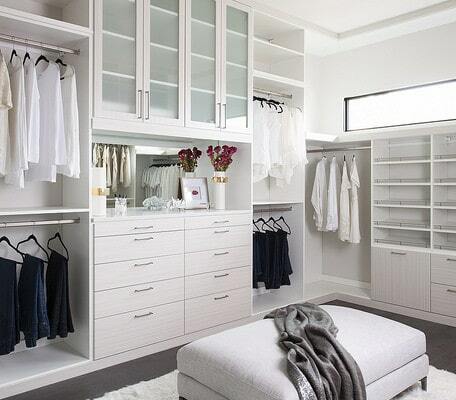 Are you ready to customize your home closets? Use these 10 ideas as inspiration, and contact More Space Place Sarasota today to schedule a free in-home consultation. A fully customized closet is a dream come true for many homeowners in the Sarasota, Bradenton, and Port Charlotte areas, as it allows them to have the exact type of storage space they need. In most cases, people create custom closets for their bedroom as a way to efficiently store their wardrobe, accessories, and personal items. However, there are many other functional uses for a custom closet. More Space Place offers some unique uses to consider for custom closets in your home. Every parent understands just how overwhelming it can be to look around the house and see towering mountains of toys in every corner. 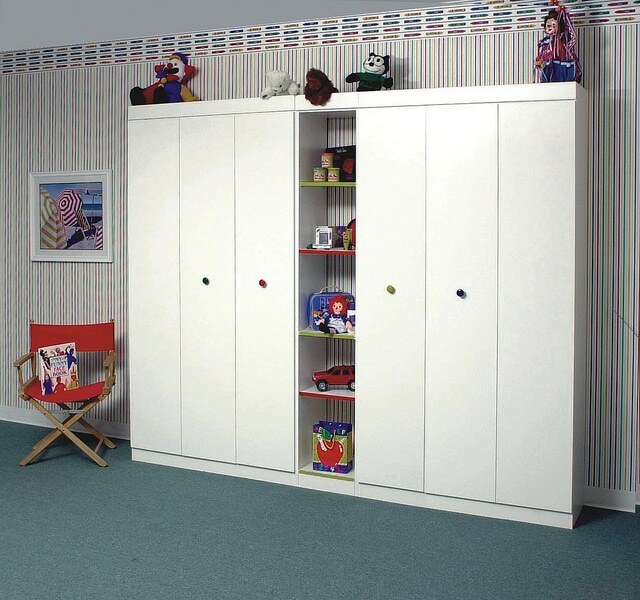 Even the most innovative toy storage solutions can take up excessive space in your living areas. 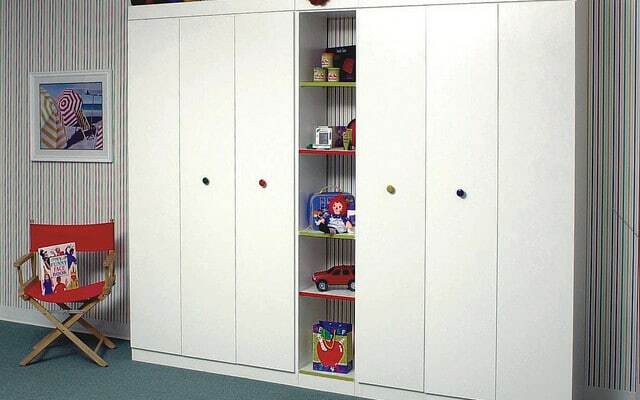 With a custom closet made just for toy storage, you can safely store all of your kids’ favorite playthings in a way that allows them to access their toys without cluttering your entire house. For those who cherish the written word, there’s no such thing as too many books. However, there are only so many places you can put a bookshelf. If your book collection has become too much for your living space, it might be time to design a custom closet that serves as your own personal library. Shelving storage and other components can be incorporated to give you the space you need for all of your treasured novels. Perhaps you like to entertain on the weekends or maybe you just like to have plenty of the finest vintage on hand. Either way, it can be challenging to store a significant amount of wine or liquor in a standard kitchen space. With a custom closet, you can create a wine cellar in your own home, complete with storage racks, beverage accessories, and even a tasting area if you desire. One of the best uses for a custom closet is to transform a standard storage space in the main living area of the home into a supply or utility closet. The right custom closet solution will allow you to store all of your cleaning supplies, such as brooms, vacuums, mops, and more. Additionally, smaller shelving can be included to accommodate cleaning products, rags, and other essentials. The handyman who has everything might not always have the space to store it. Tool storage doesn’t necessarily have to be reserved for the shed or the garage. Instead, those tools can be housed in a convenient space in the heart of the home with a custom closet. The closet can be designed to fit the needs of your space, allowing you to keep the exact tools you need on hand at all times. 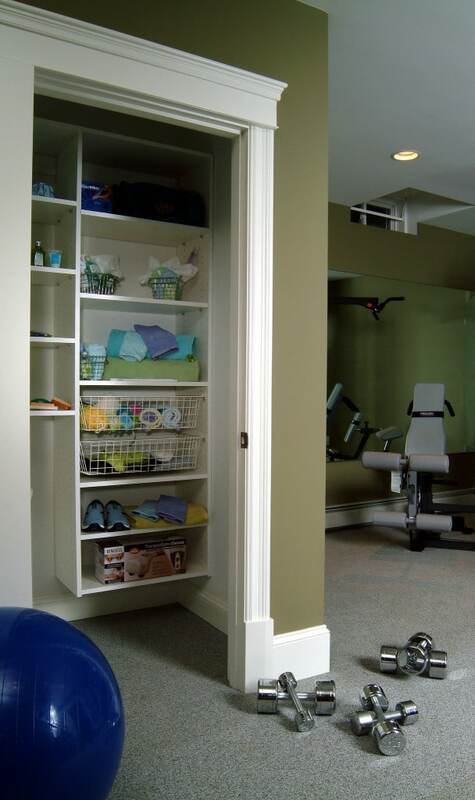 Whether you need a personalized storage space for your power suits and workout clothes or you are in need of a creative yet functional way to store the supplies for your favorite hobby, a custom closet is the best way to make the most of your space. Learn more about how More Space Place of Sarasota, Bradenton, and Port Charlotte can create a custom closet for you. Contact us today for a free in-home design consultation! Laminate Or Wood For A Custom Closet? Are you ready for a new custom closet but are unsure of how to get started? Before you design any custom home feature, such as a closet, pantry, or garage storage system, you must first assess your needs for the space. 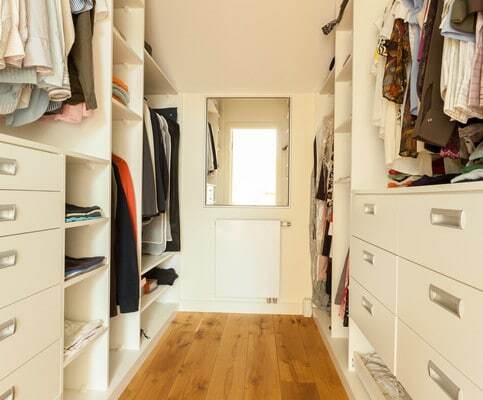 Consult with a closet design professional at More Space Place who can help you with the planning. We have three convenient locations in Sarasota, Bradenton, and Port Charlotte. 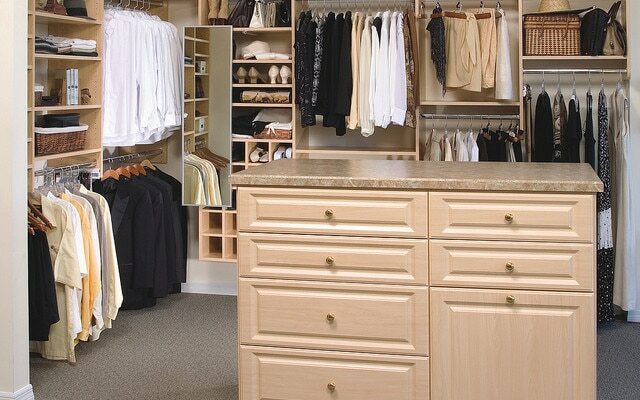 One decision you will need to make is what material to use for your closet system. We offer many options in both laminate and solid wood, and we can help you decide which is best for your needs. Is Laminate Right for You? Laminate is a good material to choose for your new closet if you’re looking for a long-lasting option. It’s easy to clean and provides flexible storage solutions, including adjustable shelving and sliding drawers for jewelry, scarves, or other small accessories. We offer a wide variety of both contemporary laminates and textured laminate finishes in various colors, making it easy to achieve the aesthetic to match your personal style. Is a Wood Closet Right for You? A custom closet with solid wood features is the most luxurious choice. Other benefits of choosing wood include flexibility and long-lasting durability. 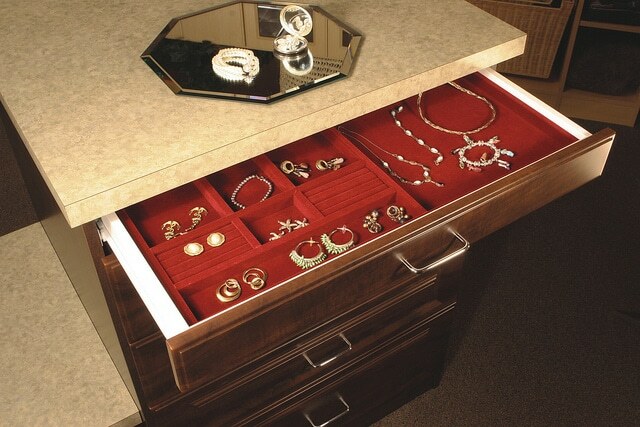 With wood, you can have lined jewelry drawers, adjustable shelves, and other special features (like an ironing board). Choose glass doors or open shelving if you want more of a display, or create a neater and concealed look with solid wood cubby doors. Consider how much of your clothing and other closet items you want to be exposed. The downside of a wood closet is it typically comes at a higher price point. 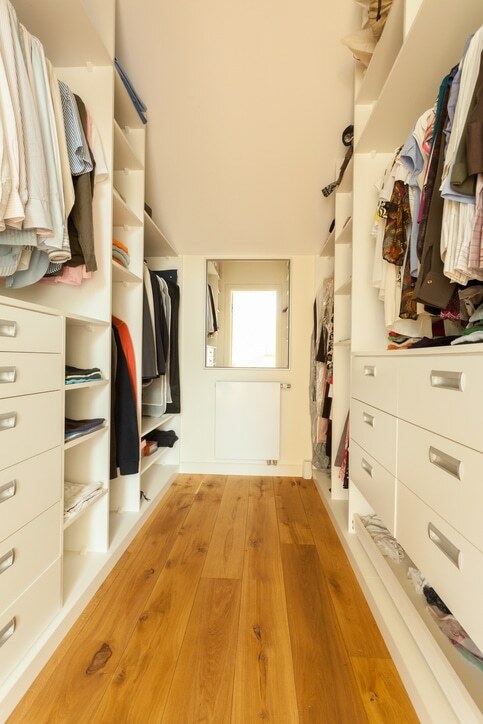 When choosing between laminate and wood for your custom closet system, talk with your design specialist about what you’re looking to achieve in terms of style and practicality. What’s best for your neighbor’s home might not be best for yours. Think about your budget, how long you want to stay in your home, whether you need flexible features, and what you want your custom closet to look like. There are many factors that can contribute to this decision, but whichever finish you choose, your new custom closet will be a dream come true! Call More Space Place in Sarasota, Bradenton, or Port Charlotte today to schedule a free in-home design consultation. Organizing one’s closet isn’t always a top priority. Life gets busy here on Florida’s Gulf Coast, and there are usually more important things to worry about. However, having an organized home can make other areas of life feel more organized, too, and having an organized closet is a good place to start. Here we’ll outline some simple tips for organizing your closet and making sure it stays that way. For many people in the Sarasota, Bradenton, and Port Charlotte areas, their closets become a go-to for unwanted or forgotten items. This is a bad habit to get into for a number of reasons. One reason is holding onto things you don’t want or don’t need can result in an accumulation of extra stuff. In time, that stuff can add up until it’s overwhelming. Instead of using your closet as a place for things you don’t know what else to do with, make sure you store each item wisely. Before you go to put it in your closet, ask yourself if it’s something you really need. If the answer is no, get rid of it. One common mistake of closet organization is putting smaller items in loosely. Doing this makes for a more cluttered and disorganized space. Instead, organize like-items together and store them first in boxes, baskets, or bins before placing the storage container in your closet. This will help keep the physical space clean and tidy, as well as help you keep track of where things are. 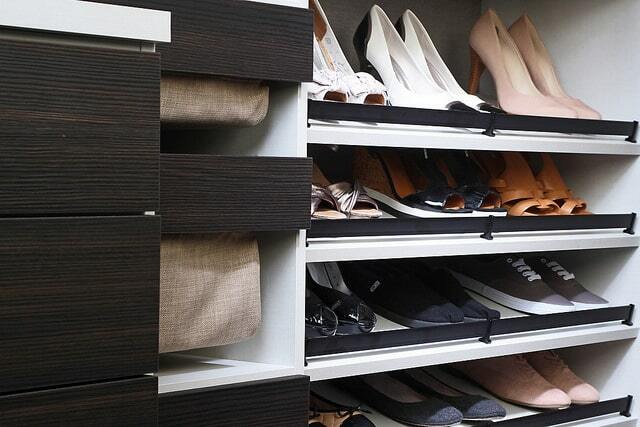 Another way to maximize organization in your closet is to use a shelving system. Shelves are ideal ways to organize a closet because they make great use of both the vertical and horizontal space available. They also prevent you from having to stack boxes and things on top of one another, which makes them more difficult to access. At More Space Place, we offer a wide variety of custom shelving units designed and built in our own factories. When using these custom shelving units, you are able to make the most of your space, while also building things to fit your specific needs. Now that we’ve shared some of our tips on maintaining an organized closet, hopefully you can incorporate some of these techniques into your own home. 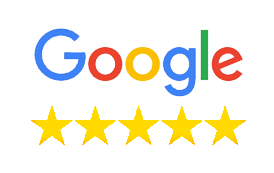 If you want to further increase your closet organization, call your local More Space Place in Sarasota, Bradenton, or Port Charlotte, and speak to a designer about creating your own custom closet today! We’ll start by providing you a free in-home consultation where you can talk through your storage needs with one of our experts.